As much as a parade is about the pageantry on display through the characters, individuals, and awe-inspiring floats, a parade can made or broken on the back of its musical selection and the way in which that music is crafted. For America on Parade, Disney dug deep and made some excellent choices that they then combined in a very familiar fashion. The team charged with finding the appropriate musical tracks and overall sound, led by vice-president of entertainment, Bob Jani, took more than three years to find just the right sound. Through their research efforts the group crisscrossed the country examining music libraries to find just the right selections that would not only be recognizable, but that would also play into the themes of the floats they were representing and would play well together and a stream of music. In the end everything from “The Battle Hymn of the Republic” and “Swanee River” to “I’ve Been Working on the Railroad” and even “There’s No Business like Show Business” made it into the soundtrack. With the music selected the work then began on how best to play the parade’s score. Early on it was decided that a mechanical music box would be the most appropriate way to go, but where would they find the right instrument? They went back to their cross-country search and ended up landing on an 1890 band organ that had been completely restored and was in a private collection in Sikeston, Missouri. Known as The Sadie Mae, her ornate decorations and drums were as inspiring as the music held within her. After her restoration, which took over 1,400 hours, The Sadie Mae included within her pipes 30 bass, 20 trumpets, 20 accompaniment pieces, 17 cellos, 17 clarinets, 17 flageolets, 17 octave violins, 17 piccolos, 17 stopped flutes, and eight trombones. The only problem with The Sadie Mae was that her inner workings, much like a player piano, required punched-hole piano books rather than a player roll. At the time only one man still made the piano books, by hand no less, and he lived in Antwerp, Belgium. The Sadie Mae was packed up for her trip across the Atlantic Ocean and the score was completed. Disney would then add a dash of synthesized effects over the top of the musical score. 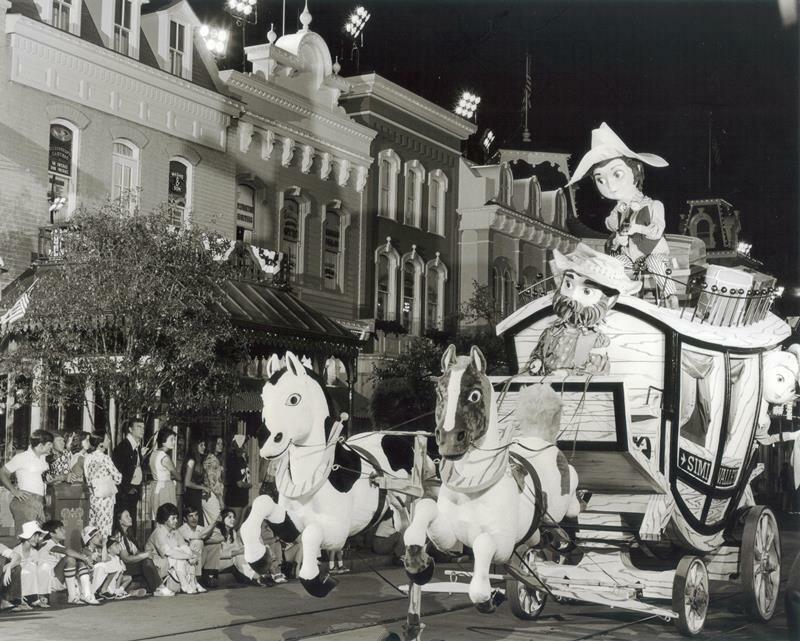 It would give the parade a similar effect to the Main Street Electrical Parade and the Electrical Water Pageants that had come before. 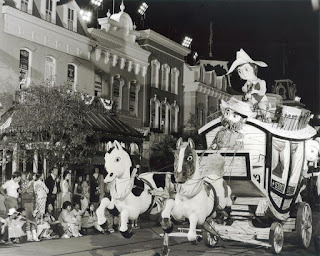 Also comparable to the Main Street Electrical Parade was the manner in which the music would be played during America on Parade, with each float responsible for broadcasting its own segment of the soundtrack to guests. It seems like a lot of work went into the musical production for a parade that would only be around for fifteen months. However, when you consider that America on Parade was the cornerstone of Disney’s Bicentennial celebration, I wouldn’t have expected anything less, would you?